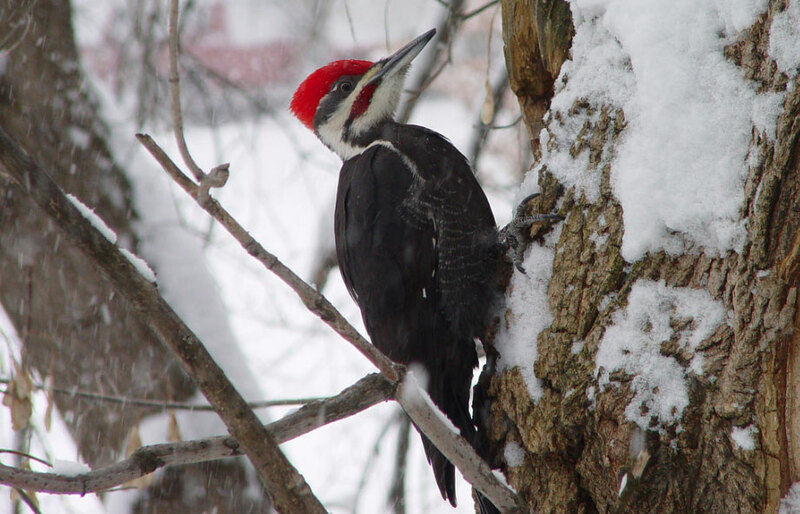 Our January Bird of the Month is the largest woodpecker in North America. The Pileated Woodpecker is a fairly common bird over most of its range (most of the eastern half of the continent and west of the Great Plains). It’s fairly shy, staying in the woods in much of its range, but individuals do learn to visit backyards and suet feeders. Anywhere, it’s a red-letter day when you get to see one. Pileated Woodpeckers can hear wood-boring ants and beetles deep in the heartwood of trees. The woodpeckers can bore through healthy wood with power only as deep as their bill is long (about 2 inches), but their insect food is often much deeper than that. To get grubs from even deeper, a pileated will dig out a huge hole longer than its body (over 1 ½ feet) and as deep as its bill. If it still can’t hack in far enough to reach the grubs from within this large hole, it will make the hole even longer so it can dig in another 2 inches from there. If you see a tree with a huge hole, always longer than it is wide and always wide enough to comfortably fit a whole Pileated Woodpecker, you’ll know who made it! These large holes are only used for feeding. To nest, a pair of Pileateds dig a hole wide enough to fit through but only tall enough to pass through coming in and out of the tree. They choose trees that are healthy on the outside but with soft, rotten heartwood so they can scoop out the rotten wood to excavate a deep nest chamber hidden inside. They also dig chambers for roosting in at night throughout the year. Pileated Woodpeckers spend a lot of time on the ground, often at the base of old trees, picking up ants and termites. They also occasionally feed on berries. Suet can provide some of the food value of insects, and so Pileated Woodpeckers occasionally visit suet feeders. 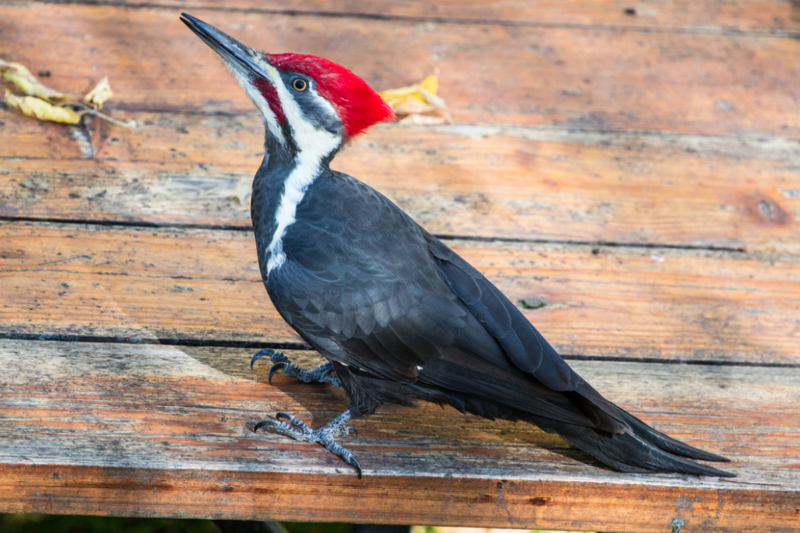 Most people who are lucky enough to attract one usually see the woodpeckers in feeders near stands of large trees, but some Pileateds come right into typical backyards, rarely even visiting window feeders. It can be disconcerting as well as thrilling to see one on a tiny suet cage affixed to a window with a couple of suction cups. The woodpeckers are heavy compared to most backyard birds, weighing about ½ to ¾ pound. By the time they first leave their nests as young birds, all Pileated Woodpeckers have red crests. You can tell the males from the females by the color of their mustache and forehead—they’re red on males and black on females. The Pileated is the only crested woodpecker in the United States and Canada. The popular cartoon figure Woody Woodpecker is also crested, and Woody’s laughing call is more like a Pileated Woodpecker than other species, so it’s easy to jump to the conclusion that Woody is a Pileated. But Walter Lanz, the cartoon’s creator, was originally inspired by a species that is much more conspicuous and comical in its behavior, the Acorn Woodpecker. Acorn Woodpeckers carve hundreds of holes in trees and other wooden structures, including cabins, to store acorns. 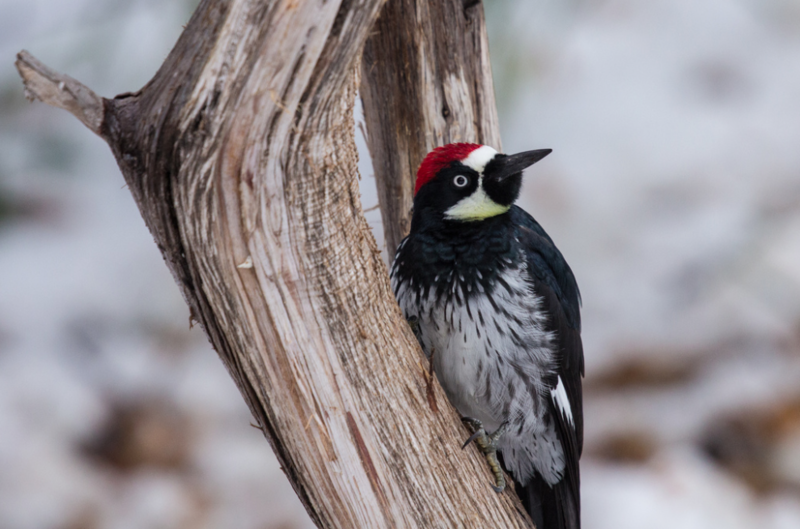 Lanz often said that during his honeymoon in California, he got the idea for Woody when a noisy Acorn Woodpecker outside the cabin kept the couple awake, and when a heavy rain started, they learned that the bird had bored holes in their cabin’s roof. Walter wanted to shoot the bird, but his wife Gracie suggested that he make a cartoon about the bird instead. Acorn Woodpeckers have a clownish, interesting face of their own, but giving Woody a crest gave Lanz and the artists he worked with more artistic license for showing Woody’s personality.